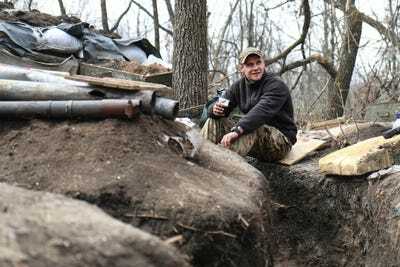 Daniel Brown/Business InsiderA Ukrainian soldier drinks coffee in the trenches outside of Avdiivka in April 2017. Since the war in Ukraine began in 2014, Russian-backed separatists have repeatedly employed all kinds of electronic and cyberwarfare tactics against Ukrainian troops. At times, Russian-backed separatists have combined electronic warfare, cyberwarfare, information operations and artillery strikes all in one. As such, a US Army colonel suggests that the US military, which has little experience fighting in such an environment, take steps to counteract such tactics in the future. As the war in eastern Ukraine rages on, so too does Russia’s invasive electronic warfare – and it’s changing how war is fought by sending threats to individual soldier’s phones, and those of their families. Since the war began in 2014, Russian-backed separatists have repeatedly employed all kinds of electronic and cyberwarfare tactics against Ukrainian troops. Although Russia’s use of electronic warfare was limited during its 2008 invasion of Georgia, Russian-backed separatists, who are funded by the Kremlin and at times commanded by Russian troops, have used it proficiently in the Donbas, a section of southeastern Ukraine where the war is fought. Russian-backed separatists are adept at psychological warafre tactics too, often in the forms of threatening text messages from cell-site simulators meant to shatter morale. 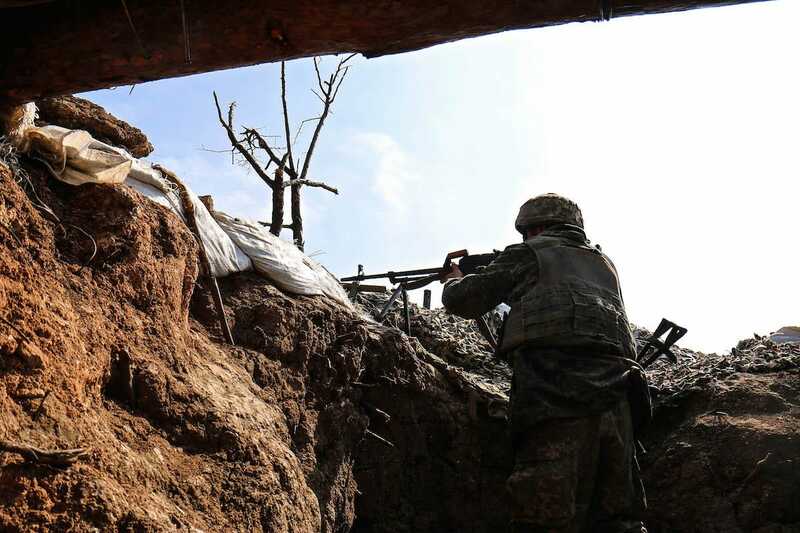 “Soldiers of [Ukraine Armed Forces], reverse your offensive to Kyiv while Kyiv hasn’t destroyed you yet,” read one text message several Ukrainian soldiers received in July near Krymske,according to UNAIN, a pro-Ukrainian media outlet. “Murderer from UAF [Ukrainian Armed Forces]. The East won’t forgive you and the West won’t remember you!” another text Ukrainian troops at a checkpoint received in November 2015 said. 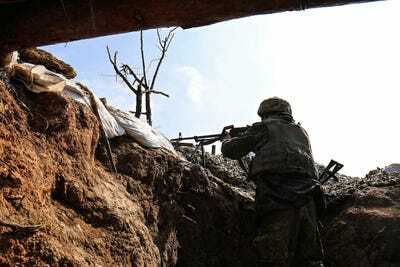 “The company commander ran away to Kramatrosk. It smells like trouble. Tonight we are also leaving,” one text Ukrainian troops in Debaltseve received in February 2015 read. “The natsyky [servicemen of the National Guard of Ukraine] vamoosed. Dnipro [volunteer batallion] was hatcheted. We should run away,” another text Ukrainian troops in Debaltseve received in February 2015 read. “Balance of you account was reduced on 10UAH. Thank you for supporting ATO,” read one text that Ukrainian troops have received. Russian hackers were reportedly even tracking and targetingUkrainian artillery units with a once popular Android app between 2014 and 2016. To be fair, Ukrainian troops have been known to wage their own kind of pyschological warfare against Russian-backed separatists by raising American flags over their bunkers, or pretending to be members of US Navy SEAL Team 6 by giving orders over the radio in English. Daniel Brown/Business InsiderA Ukrainian soldier points his weapon towards Russian-backed separatist lines outside of Avdiivka in April 2017. But Russian-backed separatists appear to have taken the game to a whole new level, sometimes coupling the texts with artillery strikes and even bringing the families of Ukrainian troops into it. “In one tactic, soldiers receive texts telling them they are ‘surrounded and abandoned,'” US Army Col. Liam Collins wrote. “Thus, in one coordinated action, electronic warfare is combined with cyberwarfare, information operations and artillery strikes to produce psychological and kinetic effects,” Collins added. The US military has little experience fighting in conditions where soldiers and their families are being individually threatened through personal phones. The US military must not only understand these new threats, but also train to counteract them, Collins wrote. Collins suggests that US “garrisons” should teach their troops more land navigation and map reading so that they don’t have to rely on GPS if it has been compromised. He also suggests that US forces should use less technology at times and become more comfortable deploying small units without knowing every little move they make.